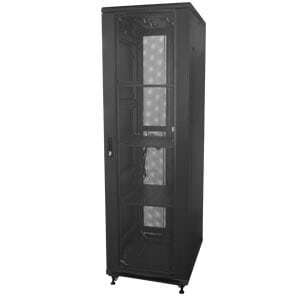 Designed for large data room applications that require a robust, fully featured server rack solution. I am interested in one of the products on the Ausrack Plus Server page of your website. An essential platform for flexible computing solutions. It is a robust, 19 inch infrastructure rack designed with a high load rating and inset corner posts, combining versatility and strength with easy to use features. Designed for large data room applications that require a robust, fully featured server racking solution with free flowing air movement. There are many door and side panel options which can be included by designing your solution from an Ausrack Plus Frame. The project required a custom solution to solve a number of unique challenges including spacial limitations, a need for specialised secure infrastructure and on-site tenant security.